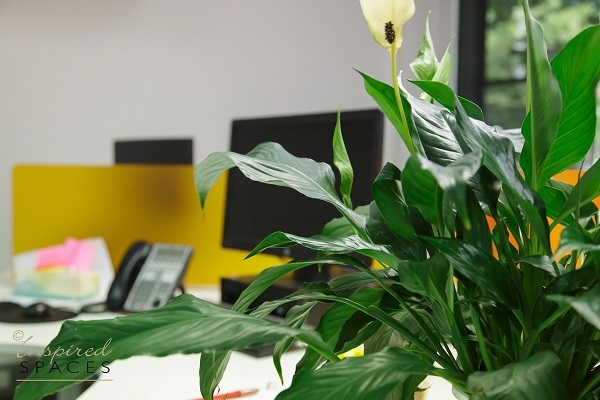 It has been proven that bringing the outside in by adding a few plants to an office space can make employees more productive and can help relieve tension and anxiety. Sure, artificial plants are an option but there are many benefits of having a natural plant or two close by. 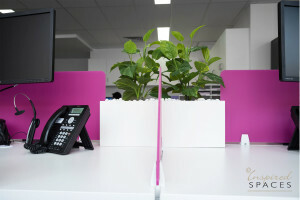 Plants provide life, warmth, colour and health benefits to your office space as well as helping with noise reduction. They absorb sound so if you have a noisy office environment then the more plants the better. Having a few plants dotted around will also improve air quality and help to remove impurities. If you are anything like me, then keeping plants alive can be a tricky job despite lots of effort. But there are a number of plants that are easy to maintain and thrive with little water and limited or artificial light. Here are a few suggestions for which plants would be good choices for the workplace. Also known as Mother-in-laws Tongue, this is a very easy plant to care for as it has the ability to withstand most conditions and can last for years. It is a tall, linear plant with stiff upright leaves that are green and white with a tinge of yellow on the edges. If watered adequately the plant can produce flowers annually on thin stems. Crotons come in a large variety of bright foliage. It is a large plant with thick stems that branch out into large colourful leaves. They are easy to grow and succeed extremely well as an indoor plant. Place in warmer, humid areas such as a south-facing window and water regularly. Smalll Cacti can tolerate being neglected by having little water and lots of light. Bowls of mixed cacti can produce interesting and decorative centrepieces for office boardrooms or reception areas. They are perfect for a busy workplace. 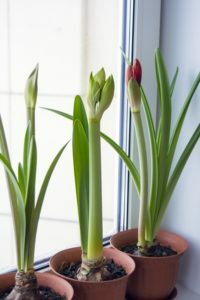 Amaryllis plants are among the easiest flowering bulbs to grow in any indoor space and produce the most beautiful blooms in many different colours. The Amaryllis generally produces it’s big, elegant lily-shaped flower on a tall stem during the cooler months and will rebloom year after year. Colours can vary between white, yellow, pink, orange and various shades of red. Bromeliads are easy to grow, hardy indoor plants and come in a variety of shapes, sizes and foliage colours. Tolerant of artificial light and a little neglect. They will only produce one beautiful and dramatic bloom in its life time, which can be one of a wide variety of colours from yellows to deep burgundies. They enjoy warmth and humidity, but also require good air movement. These plants are used extensively in receptions and offices because they add colour and vibrancy. The frequency of watering will depend on the office climate as the Bromeliad needs extra care during hot conditions. This plant will add a bit of the tropics to your office space with its large leafy foliage and pale white blooms. The peace lily is an excellent indoor plant that can tolerate low light and air conditioning. Plenty of water will encourage blooms. These are one of the easiest plants to grow indoors. They can tolerate mild neglect and minimal light. 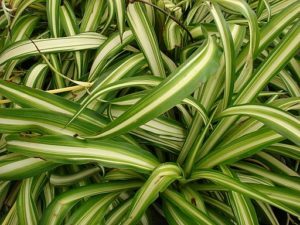 Spider plants have spiky light green and white foliage and look beautiful in an area where the stems are able to cascade over an edge. A large floor plant which not only looks stunning but has great detoxifying properties. It is said that this plant filters the air of formaldehyde and benzene which are pollutants found in furniture and carpets. This is another floor plant and it can do well in most offices. There are quite a few varieties, so it is important to choose the right one for indoors. They are capable of surviving in dimly lit areas and have the ability to help reduce Volatile Organic Compounds (VOCs) that pollute indoor office environments. Also a floor plant, can work well in the work space as it actually grows best under fluorescent lighting. It can also be called the mosaic plant because of its decorative leaves. The fittonia can be a nice focal point in your offices. Whilst most of these suggested plants require little maintenance, it is important to remember to water them regularly and place them accordingly. For example, plants that require some sunlight are placed near a window, or plants requiring a cooler and less lit environment are near some air conditioning and away from windows. A work place full of dead plants won’t look the best and certainly won’t provide any benefits for staff morale or their health. A little thought and TLC can help everyone enjoy the benefits and advantages of a green office space. Enjoy! Click here to take a look at an office we re-designed in North Sydney.